It is hard to disagree with President Obama when he tells us it is wrong for returning veterans to be unable to find work. Even Senate Republicans went along with his proposal to give tax credits to companies that hire unemployed veterans. Still, this kind of rhetoric and legislation should make us all very uneasy. 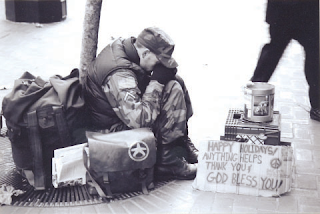 Although it sounds good in Veteran’s Day oratory, it smacks too much of telling us that the wrong people are unemployed. Government should not be in the business of deciding who should be employed and who should not be employed. Nor should anybody else be in that business. In a full-employment economy, veterans, like everyone else, would be able to find jobs. We often hear laments that older people, young people, and members of racial minorities suffer from higher unemployment than do middle-aged non-minority people, which again takes the existence of unemployment as a given and suggests it should be distributed more equitably. During the heyday of the Soviet Union, likewise, there was also a shortage of labor instead of unemployment, because state-run factories and farms (and that was all there was) were not allowed to raise wages to the point where the demand for labor would have fallen to be equal to the supply. The notorious Gulag Archipelago, or system of concentration camps, functioned as a kind of civilian draft to get needed labor for difficult projects in unpleasant parts of the U.S.S.R. There are several ways the U.S. could assure full employment without the unpleasantness of a war or Soviet-style economy. Small decreases in average wages could bring the demand for labor into equilibrium with the number of people seeking work, as was the case in World War II America and in the Soviet Union. If measures need to accomplish this are politically unpalatable, the government could become the employer of last resort, guaranteeing everyone a job at the legal minimum wage, modified versions of the WPA/CCC programs of Franklin D. Roosevelt, but on a larger scale. The costs of doing this would not be out of line with what we have lately been spending on ineffective “stimulus” programs. Whether we supported or opposed the wars they have been fighting, we can only wish returning veterans the best. But we can wish no less for all other Americans. It is time to stop talking about reducing unemployment and to start talking about eliminating it. Paul F. deLespinasse, who now lives in Oregon, is professor emeritus of political science at Adrian College in Michigan. He can be reached via his website, www.deLespinasse.org.